Posted in Uncategorized on May 9th, 2016 by Maija Haavisto — Be the first to comment! I also lost access to the Vegventures Twitter account several weeks ago, because Twitter decided there was “suspicious” activity, and has not replied to my queries. If that happened to any of my primary Twitter accounts I be fighting back, but there’s no energy left to dedicate to this. The blog will remain here as an archive of international recipes. Posted in Africa, Salads on March 31st, 2016 by Maija Haavisto — Be the first to comment! Algeria is a large country in North Africa, the largest in Africa and tenth largest (by area) in the world. It is mostly an Arab country, with Sunni Islam as the religion, though there are many ethnic groups and most people have a Berber background. Algeria has had a colorful history of many rulers and empires of different ethnicities, from the Roman Empire to the Ottomans and the French. Besides Arabic, Berber and French are widely spoken. Two large mountain ranges, the Sahara desert and the Mediterranean basin together cover most of the country. Oil and gas and their byproducts form over 90% of Algeria’s exports, making it a relatively wealthy country. Interestingly, women contribute more to household incomes than men and form the majority of university students and over 70% of Algerian lawyers. Algerian cuisine has been influenced by the Arabs, Berbers, French, Ottomans and other Mediterranean cuisines. Wheat is used a lot, especially in the form of couscous, but also kesra flatbread and even French baguettes. Meat is also consumed at nearly every meal, especially lamb, Islam forbids pork. Many foods also include eggs, but there are quite a few vegetarian dishes too. Foods often include a wide variety of spices, sometimes in spice mixes such as ras el hanout. Garlic, cumin, caraway, black pepper, cinnamon and chili are used in many dishes. Various types of beans and lentils are used. Vegetables like tomatoes, eggplant, carrots, potatoes, zucchini, cabbage and olives are often cooked into stews, cooked in tagines, a special type of clay pot where steam condenses into the flute-shaped top. Mint tea, coffee, juices and sodas are all popular drinks. Most desserts contain honey. There are two kinds of recipes for an Algerian carrot salad floating around online. I got this one from AllRecipes. 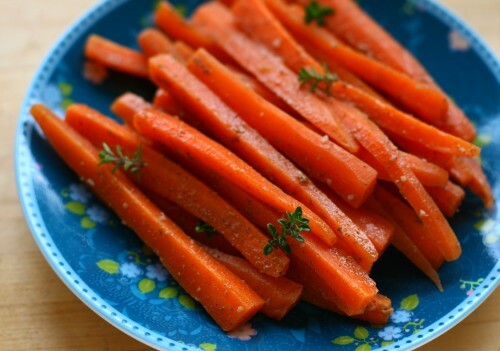 I normally never boil or steam carrots, but they’re pretty good in this recipe. Steam the carrots for 4-5 minutes, until done but not mushy. Reserve 1/2 cup of the cooking liquid. Heat the olive oil in a skillet over medium heat. Reduce the heat to low and stir in the salt, pepper, cinnamon, cumin, garlic, and thyme. Cook the spices and garlic, stirring frequently, until fragrant, about 10 minutes. Add the 1/2 cup reserved cooking liquid and the bay leaf, cover, and simmer for 10 minutes. Stir in the carrots, tossing well to coat with the spice mixture, and cook until heated through, about 2 to 3 minutes. Sprinkle with lemon juice and remove the bay leaf before serving. Posted in Drinks, South and Central America on February 29th, 2016 by Maija Haavisto — Be the first to comment! Guatemala is the most populous country in Central America. It’s a former colony of Spain, but indigenous culture and influence remains particularly strong, with most of the population having indigenous roots. Because of the country’s rich history there are many important archeological sites. However, there was a civil war from 1960 to 1996, of course taking a massive toll, and during the war the Guatemalan government committed genocide against the Mayan population. Guatemala has also suffered many natural disasters caused by hurricanes, floods, mudslides and volcanic activity. Over half of the population lives in poverty. Guatemalan cuisine is based on the Mayan cuisine. Corn, black beans, rice and chili form the staples. Tomatoes, potatoes, bell peppers, carrots, cucumber, radishes, beets, celery, chicken, turkey, pork, beef, eggs, cheeses, olives, nuts and seeds are also used in many dishes. Tamales, a type of stuffed pasty wrapped in corn or banana leaf, are very popular, and there are dozens of different varieties. Besides tamales and tortillas, soups and stews form the majority of dishes. Vegetables are often pickled or stuffed. Guacamole is served with many dishes. Some savory dishes are flavored with chocolate, fresh fruit and/or dried fruit. Desserts may include ingredients not commonly associated with sweet foods elsewhere, such as beans, chickpeas and sweetcorn, as well as bananas, plantains, cassava and chayote. 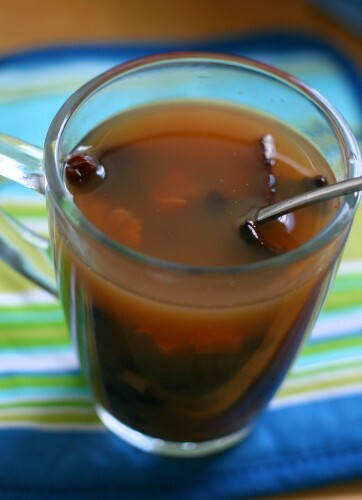 Ponche is a hot drink especially enjoyed at Christmastime, but would work well throughout the winter. My recipe is almost verbatim from this one, though I added the tamarind because I like tamarind and the blogger mentioned that commercial mixes often include tamarind. I didn’t have dried apple, so I used dried pear pieces. It was okay, but the taste of raisins was very dominant with little taste from the spices. I had to guess on the amount of raisins as the original recipe (which I halved) had one box, but didn’t say how big. Note that you will not get anywhere near 5 cups of drink out of this, as the fruit (which you’re supposed to also eat) will absorb a lot of it, and some will also evaporate. Chop the dried fruit, finely chop the pineapple. Put all fruit in a pot and cover with water, add spices, bring to a boil, reduce heat and simmer covered for 45 minutes. Remove from heat and add the sugar to taste (depends on ripeness of fruit). Fill cups with punch and fruit, serve with a spoon to eat fruit, add rum if desired. 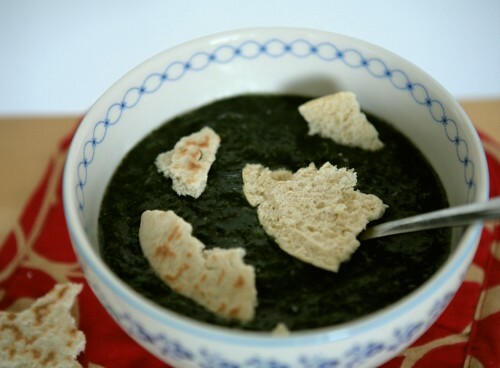 Posted in Middle East, Stews and soups on January 28th, 2016 by Maija Haavisto — Be the first to comment! Jordan is a small country in the Middle East, known for its hospitality in e.g. receiving refugees from nearby countries (Iraq and Syria). It is a fairly rich country with a very high life expectancy and is considered the safest arab/Middle Eastern country, and even one of the safest in the world. Muslims form the majority, but Christians are a visible minority and the attitude towards e.g. alcohol is liberal. Jordan is a popular tourist destination, including high levels of medical tourism. Many are also attracted by the wealth of archeological sites and museums. Jordan is a major producer of e.g. phosphate and olives. Jordanian cuisine is similar to other Middle Eastern cuisines, including well-known dishes like hummus, falafel, tabbouleh, baba ghanoush, baklava and halva. Za’atar is a popular spice which can refer to either a mix of herbs, sumac and sesame seed or Syrian oregano alone. Yoghurt (including yoghurt cheese labneh and dried yoghurt cheese jameed), bulgur wheat, freekeh (toasted green wheat), rice, beans, chickpeas, lentils, pine nuts, olive oil, parsley, garlic, onion, tomato and lemon are common ingredients. Casseroles, salads, sauces, stuffed vegetables, soups and flatbreads form typical dishes. All kinds of pickled vegetables are very popular, from cauliflower to eggplant. Tea is often flavored with mint or sage. Both Arabic and Turkish coffee are enjoyed, the former is milder and seasoned with cardamom. Molokhia, which may be written in a dozen different ways, may refer to the finished dish or just the main ingredient jute leaves (mallow leaves). They’re said to be a bitter green vegetable, but I didn’t find them to be bitter, mostly like spinach but slightly more flavourful, and super slimy. It is said to resemble okra in its sliminess, but I think it’s on a whole different level. It doesn’t taste slimy, but if you pour the soup it’s like a goop, if you touch it it leaves a slimy film on your hands. It may even stretch a bit like natto. But it’s tasty. I don’t really understand the raves you see about molokhia online, how Middle Eastern people swear they could eat only this dish for weeks. It’s good, but nothing that special, IMO. Probably very healthy. Molokhia is eaten in Levant and especially Egypt. I tried to find a particularly Jordan recipe and I hope this is one, I consulted several blogs but based my recipe on this one. You sholuld be able to find it in Turkish, Middle Eastern or African groceries, perhaps some Asian stores too. Bring the broth to boil and add the frozen molokhia, preferably unthawed. Let it simmer for about 15 minutes. Meanwhile cook some rice or toast pita bread in the oven. On a separate pan heat the oil and fry the garlic until golden brown. Add the pepper. Deglace the garlic pan with the molokhia stew (=add some of the stew to the pan and scoop it back into the main stew. Serve hot, with rice or toasted pita bread. Makes 3-4 portions. Reheats well. Posted in Baked goods, Desserts and sweets, Europe on December 29th, 2015 by Maija Haavisto — Be the first to comment! Corsica is a fairly large, mountainous island on the Mediterranean. It belongs to France as a “territorial collectivity”, which means it has some autonomy. Historically it was more closely connected to Italy (which is closer to it than France) and the culture still retains elements from this connection. Corsica is probably most famous for Napoleon, who was born there. Some people on the island speak Corsican, a language related to medieval Tuscan, but French is the main language. Corsica is a fairly popular tourist destination, considered “unspoiled” compared to most Mediterranean islands. Corsican cuisine has derived more influence from Italy than France. Chestnuts are of massive importance and are made into bread, cakes, pancakes, porridges, polenta, fritters and even beer. Local charcuterie, cheeses, olive oil and wines are also valued. Like on all islands, seafood is very popular. Soups, pastas and stuffed vegetables are typical main dishes. Several types of beans and chickpeas are used for various dishes. Mangold (chard) is a very popular vegetable. Most desserts are based on the local cheese brocciu – and/or chestnut flour. Originating from Saveur, I was supposed to post this recipe before Christmas, as it seemed appropriate for the holidays, but alas, other things got in the way, like my 1,500+ hour work backlog. 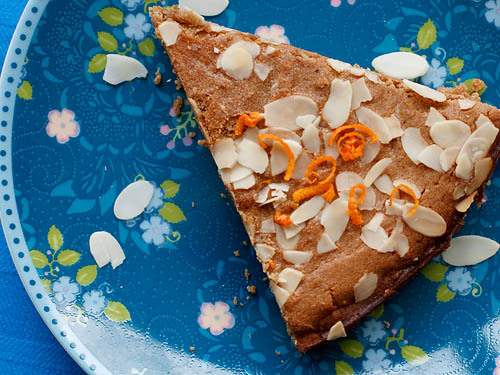 This tart was originally egg-free and gluten-free, so it was easy to remove the dairy to make it vegan. I left out the whole almonds from my version, as I don’t like whole almonds that much. It’s not immediately obvious from the photo, but the result is supposed to be very thin. It divided opinions: I thought it was pretty good but not special, my picky husband didn’t like it and my picky sister liked it (I brought the remains to Finland). My dad also ate it, but he eats pretty much anything. I do think it’s better after a day or two. You can find chestnut flour in many health food stores. I was lucky to find a bag for half off, as it’s often somewhat pricy. You can also use it to make pasta, pancakes and chocolate cakes. Chestnut flour is also allowed on the paleo diet, even though things like sugar aren’t (many allow coconut sugar, though). Most people with tree nut allergies can eat chestnuts – but you may have to skip the almonds, of course. Heat oven to 375F/190C. Grease a 10″/25 cm cake pan and set aside. Whisk margarine, sugar, milk, vanilla, salt, and orange zest in a bowl. Add flour and whole almonds and stir until smooth. Pour batter into pan; sprinkle with sliced almonds. Bake until browned and set, about 25 minutes. 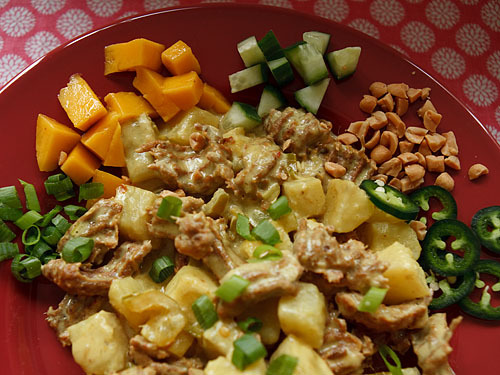 Posted in Africa, Protein main dishes on November 22nd, 2015 by Maija Haavisto — Be the first to comment! Cameroon is a country in Central Africa, with some coastline too. It houses well over 200 different linguistic groups. A former colony of Germany, after World War II it was divided between France and Britain, uniting again in 1972. The country got its name from Portuguese, though, from Camarões meaning shrimp. Corruption and human rights violations remain major problems and life expectancy is one of the lowest in the world. Breast ironing is a particular problem facing young girls. School attendance, however, is relatively high, and the economy is steadily growing. Traditional music, dance and football are important parts of the culture. The Cameroonian football team is very successfull internationally. There are also many traditional artforms, such as woodcarving, sculpture, basket weaving, embroidery, leather working and different forms of jewelry. Staple starches in Cameroon include rice, potato, plantain, corn, millet, cassava, yam and cocoyam (taro?). Fufu, a starchy porridge popular in many African countries, is somewhat confusingly known as “couscous” in Cameroon. French bread and pasta, leftover of the colonial times, are eaten, but not staples due to higher prices. Fish is eaten more than meat. Insects and various species of bush meat (wild animals) are eaten. Popular vegetables include e.g. eggplant, sweet potatoes, tomatoes, okra and bitterleaf. Sweet potatoes and plantains are often made into chips. Foods are typically seasoned with peanuts and hot peppers and fried in palm oil. Restaurants still widely serve French food. Popular drinks include tea, coffee (especially instant) and millet beer. The result was quite tasty, as you could expect. In my version I got a surprise “twist” as I used a yellow-fleshed sweet potato (orange would have looked better in the pictures, but I couldn’t get it), so the sweet potato and pineapple chunks look almost identical, you can’t tell them apart until you bite into them. I normally never attempt to serve Vegventures dishes to my husband, but this time I did and he was very happy. I held off the raisins though, as he doesn’t like them. He admitted that even the garnish, which he was suspicious about, really fit in. Fry the onion in the oil for a few minutes. Add the garlic and curry powder and fry for one more minute. Add all the other ingredients and simmer until done. Serve hot with rice. 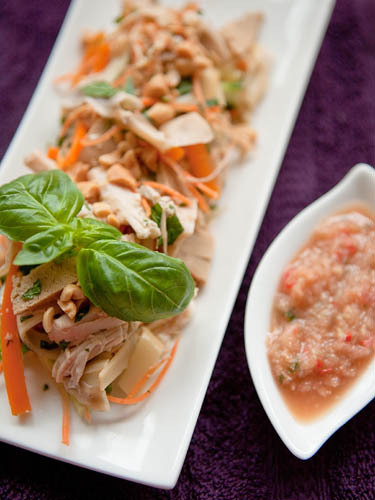 Posted in Asia, Salads on October 19th, 2015 by Maija Haavisto — Be the first to comment! Posted in Other main dishes, South and Central America on September 12th, 2015 by Maija Haavisto — Be the first to comment! Mexico is one of the largest and most populous countries in the world, located south from the United States. It has a long history, especially known for housing the Aztec and Maya culture, but also many others. Of the 120 million inhabitants 10-15% identify as indigenous. Both the name Mexico and the names of numerous foodstuffs originating from there, from chocolate to jicama, originate from the Nahuatl language, still spoken by over a million people. In the early 1500s Mexico became a colony of Spain with deleterious results, as violence and illnesses brought by the Spanish (mostly smallpox) decimated the Native Americans and destroyed large parts of the local culture. Mexico is a megadiverse country with over 200,000 different species and the largest number of species of reptiles (707) of any nation. It is a popular tourist destination, some coming for the Meso-American ruins, others attracted by the beaches on the long coastlines. Mexican restaurants are popular in many parts of the world, but many of them serve westernized “texmex” food instead of real Mexican food, e.g. guacamole with very little avocado. Mexican food isn’t just hot, greasy and beany, it can be nuanced and aromatic. Tortillas are used a lot, of course, and prepared and eaten in a dozen ways relatively unknown outside of Mexico, but also many dishes without them. Corn is also eaten in many other forms, even several drinks. Many types of chili peppers are used, unripe, ripe, fresh, dried, smoked etc, and often a food calls for a specific type of chili. Almost all dishes include a sauce, or are eaten with a salsa, usually made with tomatoes or the related tomatillo, which results in a green salsa. Mole sauces may contain dozens of ingredients, including various spices, cocoa, almonds, other nuts and honey. Many kinds of meat, seafood and dairy products are eaten. A wide variety of fruits is enjoyed by themselves, as juice drinks, desserts and in some regions also in salsas. Huitlacoche is a peculiar delicacy of fungus-infested corn, turned black. (I have seen canned huitlacoche sold here, but it was so expensive I didn’t buy it.) Besides chili, many herbs and spices are used in Mexican cooking, but cumin and cinnamon are particularly important. Achiote (annatto) gives food a red color and some flavour too, epazote is pungent and culantro is similar to cilantro. Mexican oregano has a much stronger taste than normal oregano. Chiles en nogada (chili and walnuts) is a regional dish from Puebla representing the Mexican flag with red, white and green (my sauce is pink since I didn’t peel the walnuts, for some reason pureeing walnut gives a pink result). When I first heard of it a few years ago, I knew I had to make it for Vegventures, as it is so different from what most people view as Mexican food. There is chili, yes, but no beans, corn or rice. Apples, walnuts and pomegranates may not be viewed as particularly “Mexican”. This dish is generally eaten this time of the year, before Mexico’s independence day (16th September), in some areas more in tune with the pomegranate season, from October to January. 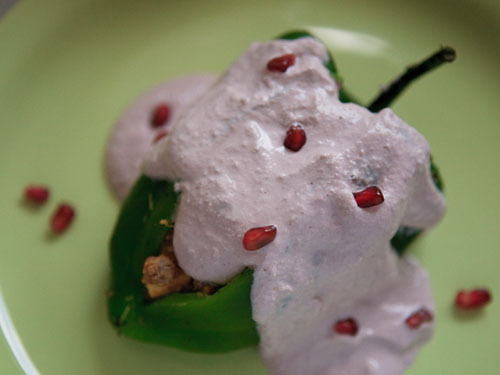 I based my recipe mostly on this vegan chiles en nogada, but also looked at several other ones, including omni recipes and Ricki Heller’s vegan recipe. My main recipe had different seasonings from every other recipe, so I trusted the others. It is very tasty, though my husband found it too sweet. The walnut flavour in the sauce is quite mild, so even if you don’t like walnuts you should like this. I could only think of one store in Amsterdam that could have poblano peppers and they did. They’re large and not very spicy, though apparently some peppers can be spicier than others. If you can’t find poblanos, you can probably use normal green peppers (the large type that tastes like bell pepper) and perhaps brush them with a little chili oil inside before stuffing. This dish should be easy to make even paleo by using something else instead of TVP, like chopped nuts. Several places list two peppers as the serving size, but I think one per person makes a fine meal with something on the side, like a salad and perhaps bread. It’s quite filling. Note that you should soak the walnuts overnight! You’re also supposed to rub the skins off, but people have commented that it can take hours, and besides dying the sauce it has very little effect on the flavour. Char the peppers in open fire, barbeque or in the flame of a gas stove, like I did. Note that they need to be quite charred in order to peel easily and to be actually cooked and soft. I thought mine were done when they were floppy, but they could have been better cooked. Place them in a container with a lid to let the steam help membrane-like skin peel off. Peel them. Alternatively just roast the peppers in the oven for some 20 minutes (and no need to peel). Make a slit in each pepper and remove the veins, seedpod and seeds, but don’t break off the base. This is somewhat difficult but doable. Make the picadillo. Fry the onion in oil until translucent. Add the garlic and fry for one more minute. Add all the other picadillo ingredients and a splash of water and let simmer for a bit. Stuff the peppers with the picadillo and top with the sauce and pomegranate seeds. The dish may be served warmed or at room temperature. Note that the sauce, at least if made with cashews, tends to act a bit weird when reheated and easily starts to solidify, as cashew sauces have a tendency to do. 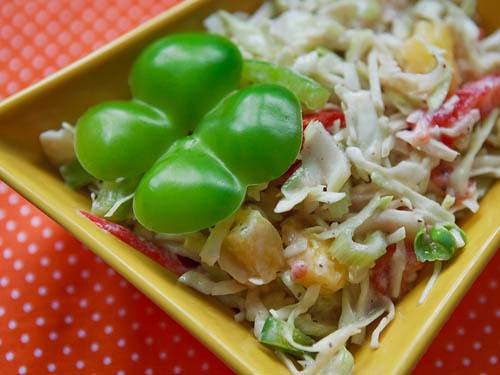 Posted in Salads on August 28th, 2015 by Maija Haavisto — Be the first to comment! The Gambia is a tiny country in West Africa, the smallest country in mainland Africa, and geographically quite peculiar. It is essentially just the delta area of the Gambia river, less than 50 km wide at its widest, and completely surrounded on the land side by the much larger Senegal. E.g. in the African map in Wikipedia you can hardly see Gambia. Still, the country is fairly well known by name, perhaps thanks to its football team. The Gambia is a former colony of Britain and only left the British Commonwealth in 2013. English is the official language, but most people are Muslims. Coconuts, cashews, Brazil nuts and peanut oil are major exports. The Gambian cuisine is similar to other West African cuisines, the colonialists barely having left their mark. Fish is eaten a lot, obviously, considering the location of the country, and also oysters caught from the river Gambia. The staple starches are rice and cassava, but wheat and millet are also eaten. Other common ingredients include peanuts, eggplant, tomato, carrot, pumpkin, okra, cabbage, beans and black-eyed peas. Food is often spicy and may also be seasoned with herbs, Maggi cubes and lemon or lime. These foods are often combined into stews with many ingredients, sometimes cooked for hours. Baobab juice is a popular drink. You can get dried baobab from many health food stores and superfood shelves, I find it quite tasty. Wonjo juice is made from hibiscus flowers. Tapalapa is a bread described similar to baguettes but denser, sometimes served with jam, but usually with plenty of savory toppings. This recipe, found in e.g. some cookbooks, is listed in many places as a “West African salad”, without listing a specific country. However, I found a very similar salad, with onions instead of tomatoes and green pepper described (without an actual recipe) as Gambian, and tomatoes are used a lot in Gambia, so I think this is a Gambian salad, or at least close enough. You could make it paleo by using coconut or almond yoghurt/milk – the aforementioned Gambian dish also contained coconut milk. Mix all the vegetables together in a bowl. Add the soy milk and herbs and mix. Add as much soy yoghurt as is needed to hold the salad together. Let the flavours mingle in the fridge for a few hours before serving. Makes 3-4 portions. Posted in Casseroles, Europe on July 31st, 2015 by Maija Haavisto — Be the first to comment! Switzerland is a small landlocked country in Central Europe, known internationally for many things: the Alp mountains (and related things, such as skiing and alphorns), Swiss banks, Swiss chocolates, Swiss cheese and Swiss watches. Many also know that the Red Cross (and the Geneva Convention) originates from Switzerland – its logo is actually the Swiss flag (which peculiarly is rectangular) with the colors reversed. Switzerland is the wealthiest country in the world on several indices. Switzerland has tended to be neutral and independent in political issues: it was not involved in either of the world wars, is not a member of the EU and only became a full member of UN in 2002. Switzerland is divided into four regions with different cultures and languages: German, French, Italian and Romansh (not to be confused with Romanian). It is also divided into cantons, with a lot of regional legistlation. Casseroles aren’t exactly summer fare, but I had a bag of Wilmersburger vegan cheese to use and couldn’t think of any other Vegventures recipe to use it in. Wilmersburger is great stuff: tastes real enough to suit most omnivores, melts, soy-free for those who need that, keeps very well, not very pricey. The only dowside is that it barely has any protein, which for someone like me, who has to eat fairly low-carb and high-protein, is a real problem. Well, this dish doesn’t have anything to do with low carbs, anyway. Jeezini and Violife are two other European vegan cheeses that are very similar. I don’t know about the U.S. – I recently had Daiya for the first time and despite all the praise, I found it vile. Anyway, use whatever you like. I looked at several recipes but based my vegan Älplermagronen mostly on this and this (PDF). There are different cuisines in Switzerland, divided largely by the language borders. French-speaking people tend to eat French-influenced food, Italian-speaking people Italian-influenced and German speakers German-influenced. Most of the cuisine is heavy on potatoes and cheese. There are many famous Swiss cheeses, such as Gruyere and Emmenthal. Rösti is also an internationally-known dish similar to hash browns, made with grated potato which is fried – often with some cheese. Rösti was originally a breakfast dish, but has been replaced by muesli, another Swiss invention enjoying international popularity, and now is mostly eaten as a side dish. Cheese is also melted into fondue and the related raclette. Sweet and savory tarts and savory quiches and many kinds of breads are very popular. 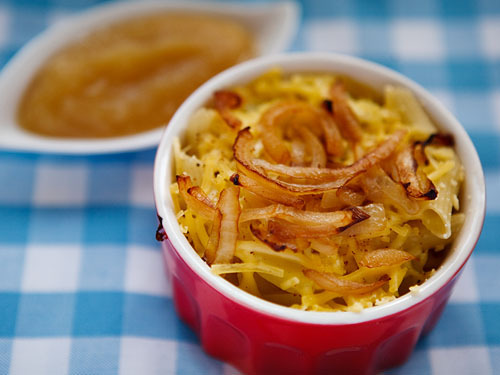 Älplermagronen (from the German parts of Switzerland) is a baked pasta dish with potatoes and cheese, topped with browned onions and served with applesauce. The recipes vary: some have much more pasta than potatoes, some have even more potatoes than pasta. Some instruct to bake the onions with the casserole, some to serve them separately. In some you warm the applesauce, in others you make it and then cool. Well, this is what happens with all traditional dishes. I went for baking the onions and using cold applesauce, because it just seemed more appealing to me. You should be able to make gluten-free älplermagronen if you use non-mushy gluten-free pasta. Heat the oven to 375F/ C. Put a large pot of salted water to boil. Add the pasta and potatoes and cook until both are done (if the pasta is very quick-cooking, add the potatoes first for a few minutes). Stir a few times to make sure the pasta doesn’t stick together. Drain. Line an ovenproof baking dish with baking paper (not necessary but makes cleanup a lot easier). Spread 1/3 of the potato-pasta mixture at the bottom. Sprinkle with 1/3 of the cheese. Repeat twice for three layers. Pour in the cream. Bake for 15 minutes. Serve with the applesauce. Makes 6-8 portions.